Our baby luxury swaddles have adjustable self-fastening flaps that securely snuggle your newborn or infant in a safe, universal-fit swaddling sleep sack. You don't have to remember any swaddle techniques, and your baby won't be able to squirm out of our swaddles as often happens with regular swaddle blankets. The universal fit design measures 26 inches in width (when open) and 21 inches in length so it easily fits baby boys and girls 7-14 lbs. This swaddling technique mimics the womb and makes your infant feel safe and warm while preventing the startle reflex. In practice this means that your baby can often sleep through the night without waking. 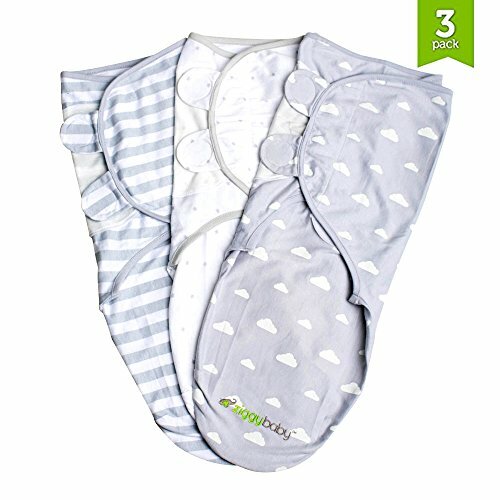 Great for your baby and a lifesaver for parents, who can finally get some rest as well! Safely swaddling your baby also reduces risk of suffocation while maintaining a consistent body temperature. This way you avoid overheating and you can rest easy knowing your baby sleeps safely. Our swaddles are made of 100% high quality cotton. The material is soft and breathable and comes in three stylish and trendy designs: Grey Cloud, Stripe, and Stars. These unisex swaddle wraps are the perfect gift set for boy or girl baby showers because they compliment any modern nursery décor. Add to your baby registry or add to your cart for the perfect baby shower present. You can complete your crib bedding sets with our matching Ziggy Baby grey and white crib sheets, changing pad covers and muslin swaddle blankets. We honor a No-Questions-Asked Return Policy so you can Add To Cart With Confidence. SWADDLING MADE EASY - Swaddling your baby snugly and securely becomes easy with our swaddle wraps. 3 easy steps, no late-night struggles. A must-have and true lifesaver for new parents. NO MORE SLEEPLESS NIGHTS - Your baby boy or girl will sleep longer and more soundly with our adjustable swaddle blankets. The swaddle creates a womb-like feeling and prevents the startle reflex, allowing your baby to sleep through the night. Your baby will stay securely swaddled and won't squirm out, so you can rest easy knowing your baby sleeps safely. SOFT & BREATHABLE, 100% PREMIUM COTTON - Our baby swaddles are not only beautiful, but also lightweight and breathable. The lightweight material prevents overheating and keeps your baby comfortable. The swaddles come in three gender-neutral designs and make the perfect baby shower gift to add to any baby registry. UNIVERSAL FIT, FOR NEWBORN BABIES & UP - The adjustable sleep sacks have soft fabric wings that fasten securely with hook and loop attachments to create a perfect fit. Ziggy Baby swaddling blanket wraps are perfect for babies, newborns or infants 7-14 lbs. If you have any questions about this product by Ziggy Baby, contact us by completing and submitting the form below. If you are looking for a specif part number, please include it with your message.